About a dozen people have been injured in an explosion in the Turkish Mediterranean resort of Antalya, an official said. 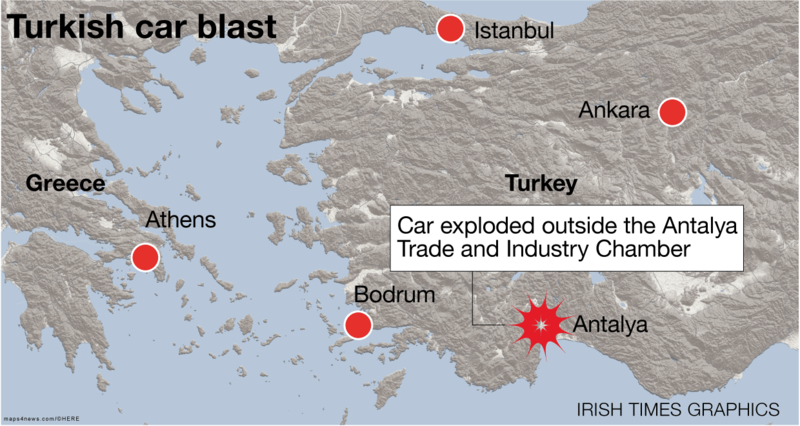 Mayor Menderes Turel said the cause of the Tuesday blast, inside a car parked outside the Antalya Trade and Industry Chamber, was not immediately known. He said it may not have been the result of a terror attack. Ten or 12 people were hurt by flying glass but none of the injuries was serious, the mayor told NTV television. The blast damaged at least four cars in the parking area and shattered glass panels inside the building, which is on the outskirts of Antalya. Turkey has been rocked by a wave of deadly bomb attacks in the past 18 months, which have been blamed on Kurdish rebels or Islamic State militants. But Mr Turel said the blast may be the result of an accident – an explosion inside a car running on liquefied petroleum gas – and not necessarily an act of terror. Antalya is a major tourism destination for Turkey, which has seen a sharp drop in visitors following the spate of violent attacks. Earlier this month, three rockets believed to have been fired by Kurdish militants hit a fishing company depot near Antalya. No one was hurt in the attack. On Tuesday, several ambulances were dispatched to the scene and police sealed the trade centre’s perimeters in case of a second explosion. The blast happened as employees were arriving at the building for work and just hours before the trade chamber was to hold a meeting, to be attended by the mayor.